The Orbital ATK freighter was launched atop a United Launch Alliance Atlas 5 rocket on March 22 from Cape Canaveral, Florida. 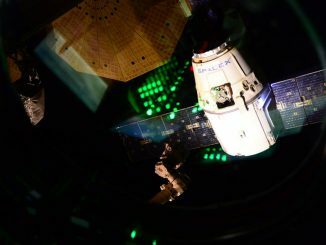 It performed a flawless rendezvous with the station on March 26 for grapple by the station’s robotic arm and berthing to the Earth-facing side of the station’s Unity module. Dubbed the S.S. Rick Husband for the fallen commander of shuttle Columbia, the craft delivered over 7,000 pounds of fresh supplies, food and science research equipment to the station. 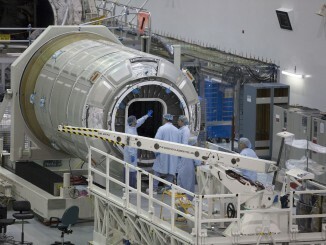 After loading about 4,100 pounds of trash and materials for disposal, the hatchway to Cygnus was sealed up. The robot arm grappled Cygnus on Monday. Early Tuesday, 16 electrically-driven bolts on the station holding the ship in place will be loosened to permit the unberthing. Departure of Cygnus is scheduled for 9:30 a.m. EDT (1330 GMT) by Expedition 47 robotic arm operators Tim Kopra of NASA and Tim Peake of the European Space Agency. About four hours later, an experiment packed inside the freighter, called SAFFIRE, will be performed to observe the propagation of a large fire in microgravity. “A spacecraft fire is one of the greatest crew safety concerns for NASA and the international space exploration community,” says Gary Ruff, Saffire project manager. 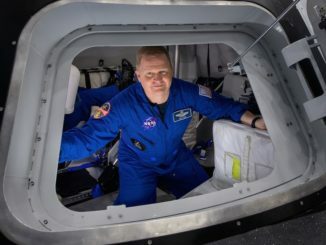 The blaze will be contained within an instrumented research box — measuring 35 by 52 inches (3 by 4.4 feet) — that is strapped into the commercial freighter for the first-of-its-kind test. The fiberglass-cotton fabric sample measures 15.7 inches wide by 37 inches tall. SAFFIRE instruments will measure oxygen, carbon dioxide, heat, pressure and flame growth, and two video cameras provide views of the flame. After the fire is started, the entire burn of the sample is recorded, then the data is compressed and downlinked to Earth. Deorbiting of Cygnus is planned for June 22, after spending a week downlinking data from SAFFIRE to scientists on Earth.